The very idea of dogs as meat is unthinkable for most people, but an estimated 30 million dogs are slaughtered each year for local consumption in a handful of Asian countries, including China, Philippines, South Korea, and Vietnam. We'd be wrong, however, to think the vast majority of the people in these countries participate as suppliers or consumers: dog meat is considered something of a delicacy, and is not a staple food for the poor. We would also be wrong to assume that vast majority of people in these countries are comfortable with the whole crude, sickening enterprise. It's partly on that assumption that The HSUS and Humane Society International have made ending the dog meat trade a major priority, getting on the ground in these nations to help bring an end to this betrayal of a bond first forged between humans and dogs 30,000 years ago. Working with local activists, partner organizations, economists, law enforcement officials, industry representatives, and the governments in these countries, we are working to find the most effective and innovative ways to end the trade in dog meat once and for all. In China, we are campaigning to end the Yulin Dog Meat Festival, a barbaric event at which dogs are slaughtered by the thousands each year. HSI has been collaborating with partners on the ground and with the government to stop the Yulin festival since 2013. HSI is also working with local advocates in China to rescue dogs from trucks headed for the meat market. Last year, we supported our partner groups in the rescue and care of 2,500 to 3,000 dogs bound for the slaughterhouses. This year we have been involved with intercepting six trucks and provided assistance to an estimated 2,300 dogs. In Vietnam, HSI is part of a coalition, the Asia Canine Protection Alliance (ACPA), which has hosted several conferences with participation from the governments of Thailand, Vietnam, Cambodia and Laos, as well as human and animal health experts to highlight the dangers of an illegal trade in dogs and dog meat. 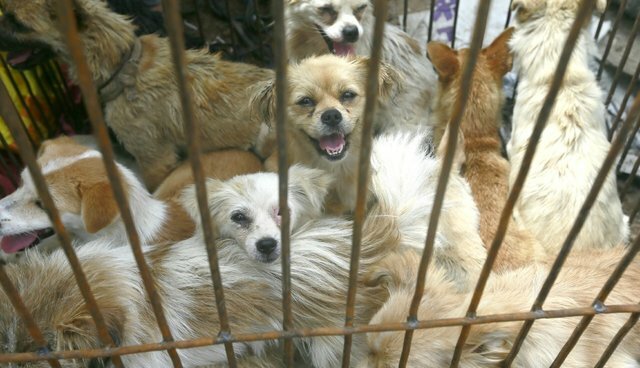 At a Hanoi conference in 2013, high-level officials from Cambodia, Laos, Thailand, and Vietnam agreed to a five-year moratorium on the international commercial trade in dogs destined for human consumption. This has significantly slowed the commercial business of dog stealing for export. In January 2014 and again in January 2015, ACPA members led by the Soi Dog Foundation were represented at a meeting with Members of Parliament at the British House of Commons to discuss the dog meat trade. An unprecedented 136 MPs signed a letter urging an end to the trade. In 2007, HSI supported increased protection for dogs in the Philippines with the passage of the national Anti-Rabies Act which prohibits the slaughter and trade of dogs for meat as a means to limit the spread of rabies. The Philippines is the only Asian country with a law banning the commercial dog meat trade, but the measure carried no real penalties and it went largely unenforced. HSI helped to fund, campaign, and support local groups in their efforts to push for the implementation of strong penalties and enforcement. HSI has also worked with the group Network for Animals and with local law enforcement officers in a series of dog meat transport and slaughterhouse seizures, rescuing hundreds of dogs since 2011. We have provided temporary sheltering, rehabilitation and rehoming for rescued dogs. In South Korea, the only country in which people farm dogs commercially for human consumption, we have been working directly with dog farmers to identify ways to shut down the farms and help those involved transition to humane agriculture. So far we have closed down three farms and rescued more than 200 dogs destined for the slaughterhouse. The HSUS and HSI transported the dogs to the US for adoption to new, loving homes through our local emergency placement partners, as a means of saving these poor creatures and also raising the decibel level on this issue. We are also engaged in a public awareness campaign in South Korea that focuses on the cruelty behind the trade, and raising awareness about dogs as pets and not food. With public awareness in the US at an all-time high, a direct result of our focus in recent years, we also are planning Congressional initiatives to ban the slaughter of dogs for human consumption. These are just the high points of our campaign. We have a challenging task ahead, as we work to create an atmosphere where the farming and the rounding up of dogs for human consumption is seen as shameful, and provide an alternative to help people involved in this business to find a better means of making money. But as the details above reveal, HSI and its partners are also making progress at an astonishingly fast clip. We'll not relent until the era of betraying the trust of these creatures and killing them for their flanks and ribs has come to an end, once and for all. Join us in speaking out against the cruel dog meat trade today.